About Scrumpy Soap Co and Why they make soap from home - Scrumpy Soap Co. The Scrumpy Soap Co is located in Perth Western Australia. 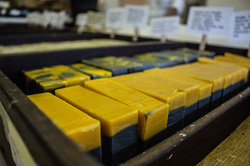 We are soap manufacturers who use the old fashioned 'cold process' soap making method and are fastidious about using only 100% natural ingredients and top quality organic vegetable oils, essential oils, botanicals and clays in our soaps. We lovingly make all the soaps by hand in small batches, we measure every pure ingredient, we individually hand cut our soaps and hand wrap them. We use simple, everyday natural ingredients sourced mainly from the South West of WA. Sometimes we have to go further afield to get the best quality product. The Scrumpy Soap Co uses rain water and spray free herbs grown themselves in the making of their soaps and are working towards becoming a zero waste business. The business is run incorporating personal values of reducing their carbon footprints, to live without being greedy and offering truth in labelling. We use the cold process method to make our soaps with local Olive oil as the base, which is an old fashioned soap making process and add at least Two other oils which vary depending on the products requirements. All the natural goodness is retained, including the skin-loving glycerine. Glycerine is a bi-product from the soap making process and it is removed from many commercial soaps and replaced with synthetic foaming agents, soap scum inhibitors, artificial colour, preservatives and hardners , leaving you with nothing more than a detergent bar. These agents are irritating to the skin and this is why some people have allergic reactions to commercial soaps. We retain all the skin-loving glycerine, have no artificial additives and have always been Palm oil free. Glycerine prevents skin dryness, acting as a humecant drawing moisture to the skin, preventing excessive drying and evaporation. The added moisturising properties of glycerine means our soaps are suitable for people with sensitive or easily irritated skin. Each soap is then cured and hand-cut into generous slices between 110 -140 grams, so you can enjoy the ultimate indulgence at home. Our soaps are almost entirely vegan friendly however we have 2 soaps that are vegetarian -they contain honey or goats milk. Our soaps generally take 4-6 weeks to cure and are not factory produced and we never take short cuts or use premixed goods to make our soaps as we insist on being certain of their origin and quality. We also sell other all natural products we have made such as dead sea and pink Himalayan bath salts, baths oils with essential oils and 100% pure essential oils for use in diffusers and the bath which will be available online in 2016. Currently they are only available at our market venues. We also hand make soap for other businesses under their name. Please feel free to contact us to discuss.